Congratulations to Los Angeles Metro, the latest transit agency to make connections (also called transfers) free. There are footnotes: you have to be using a smartcard, but if you're in Los Angeles for more than a day or two you should already have one. The big point is this: The core of the Los Angeles transit network is the liberating high-frequency grid, which relies on the assumption that passengers can be asked to change buses once. Until now, the agency's policy of charging passengers extra to change buses was in direct conflict with the foundational principle of its network design. Once more with feeling; Charging passengers extra for the inconvenience of connections is insanely self-destructive. It discourages exactly the customer behavior that efficient and liberating networks depend on. It undermines the whole notion of a transit network. It also gives customers a reason to object to network redesigns that deliver both greater efficiency and greater liberty, because by imposing a connection on their trip it has also raised their fare. For that reason, actual businesses don't do it. When supposedly business minded bureaucrats tell us we should charge for connections, they are revealing that they have never stopped to think about how the transit product is different from soap or restaurants. The difference is that your success relies on products working together, the so-called network effect. So tell them to think about airlines: Fares that require a connection are frequently cheaper than nonstops. That's because the connection is something you endure for the sake of an efficient and broadly useful airline network, not an added service that you should pay extra for. There was, for a while, an argument against free transfers that arose from the ease of abusing paper transfer slips. These slips, issued in return for a cash fare and to be presented on your second bus or train, were easy to give away or sell. Many US systems eliminated transfers and offered day passes instead, which improved security but at the high cost of discouraging spontaneous trips. In any case, as soon as a transit agency has a working smartcard, there's no excuse for connection charges. They sometimes linger because managers and elected officials are desperate for revenue but are afraid to raise the base cash fare. In some cities, local journalists are too lazy to understand fare structures and just write quick scare stories whenever the base fare goes up. This motivates transit agencies to do desperate and devious-looking things to raise other charges, just as a simplistic obsession with low fares has caused airlines to invent endless fees. But what matters is not just that the fare be low. It needs to be fair, and it needs to encourage people to use the system in more efficient ways. An efficient and liberating network requires connections, so penalizing connections is an attack on your network's efficiency. This guest post is by Ron Kilcoyne, is the General Manager of Lane Transit District, which serves the Eugene-Springfield area in Oregon. He is formerly the General Manager/CEO of Greater Bridgeport Transit in Bridgeport, Connecticut and of Santa Clarita Transit north of Los Angeles. For many years he was manager of research and planning for AC Transit in Oakland, California. The views expressed are his own and not those of his agency. alternative. These views have often been considered elitist and condescending. thee buses if they didn’t have to? use that may be what the person chooses. don’t want to be felt sorry for –they want useful transit service. is perceived as an attractive alternative. that can translate into more resources for more service. transit as merely a social service. Postscript by JW: Opinions in guest posts are not my own, obviously, but to be clear, as a consultant I do not take a position on the ridership-coverage trade-off. This trade-off is a non-technical value judgment, a choice between two things that most people want, and thus a decision that communities should make through their officials. My role is always to help communities form their own view on this question, which I as a consultant can help them implement. Nottingham, UK now highlights frequent services on its network map. More detail at the link. Often when you first map the frequent network, you notice for the first time how self-disconnected it is. Nottingham's frequent network is entirely radial with just one frequent orbital (crosstown) service spanning about 45 degrees of arc along the west side, easily seen on the full map. The orbital is an extension of a radial, but it's clearly in an orbital role for a while. Under the proposed plan, which costs no more to operate than the existing one, here's where you'd be able to go, at any time of day, on service that's coming soon. The network still includes coverage to all corners of the city that are covered now, and ensures plenty of capacity for peak commuters into the city. But meanwhile, it defines an extensive network of high frequency services around which future urban growth can organize to ensure that over time, more and more of the city finds public transport convenient. What's the catch? Only the geometrically inevitable one: more people will have to make connections from one service to another, and the fare system will need to encourage rather than penalise that. Whenever someone tells you that it's too expensive or hard to encourage people to make connections, ask them how expensive it is to run the only the first network above while spending enough money to run the second. Networks that are designed to prevent transferring must run massive volumes of half-empty and quarter-empty buses and still have trouble delivering frequencies that make the service worth waiting for. The waste involved can be colossal, as you can see from the amount of service we were able to redeploy in more useful ways with this redesign. To see a bit of the structure clearer (and also because it's a cool graphic), here's the central slice of the drawing of the proposed frequent network, by my MRCagney colleague Nicolas Reid. It's currently all over the media in Auckland, helping people assess the plan. By streamlining it calls attention to the logic to the network — a logic that's sometimes easy to lose track of when following the details of every right and left. Look at the whole thing. I'm very proud of what our team achieved working with the excellent folks at Auckland Transport, and I hope the plan will be further improved as a result of public feedback, as good plans always are. But as Aucklanders begin discussing the plan, I hope they stay focused on the core question: Are you willing to get off one vehicle and onto another, with a short wait at a civilised facility, if this is the key to vastly expanding your public transport network without raising its subsidy? That is the real question before Auckland now. The rest is details. Peter Brown is a lifelong UK transit enthusiast (and an HT reader from the earliest days). He is a member of the Light Rail Transit Association (LRTA), and a former volunteer tram driver at Seaton Tramway, Devon, England. Twenty six years after the Thatcher government deregulated local bus services in the UK (outside London and Northern Ireland), the calls for some form of re-regulation persist. The latest issue is the stated ambition of the Tyne and Wear Passenger Transport Executive (PTE), which today calls itself 'Nexus,' to restore government control of planning and management for the bus system in the Newcastle-upon-Tyne/Gateshead/Sunderland conurbation. This is significant because for a few years in the 1980s this authority operated the UK's only example of an integrated transport system on a par with European best practise — a system that was destroyed by the Thatcher government. In the early 1980s, the Tyne and Wear PTE directly operated a large bus system which was formed by the takeover of the former municipal fleets of Newcastle, Gateshead, and Sunderland, and also built and operated the LRT system (The Metro). During the short life of this integrated system it was possible to travel between any two points on a single ticket by bus, local train, Metro, and ferry services. The bus system was redesigned to feed into the metro at purpose built interchanges for journeys into central Newcastle, thus reducing bus movements across the heavily congested Tyne bridges. Unfortunately the Thatcher Government deregulation of bus services destroyed this integrated network. Deregulation swept away a regulated system that had existed in the UK since the 1930s. It meant that bus companies (referred to as ‘Operators’ in the UK) had to self financing through the fare box. Blanket subsidies and any form of network co-ordination (or what Americans would call "integrated network planning") were terminated. 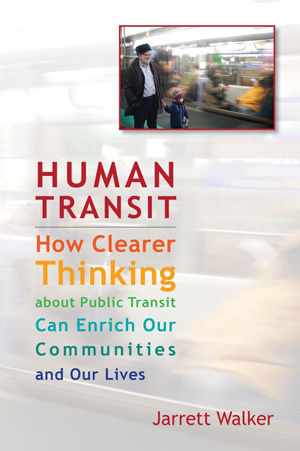 In short, it became illegal to think of transit as a public resource, integrated with the city, and managed for greatest possible efficiency and usefulness. Instead, the ideal became competition. Bus operators could operate "commercial" (non-subsidised) networks anywhere, and the role of local government became to purchase subsidized services wherever more service was desired. Integrated transit features that many cities take for granted — including citywide fare systems, lines that aim to connect with one another, and rational management of limited resources, became effectively impossible. Yet if the goal was competition, the system failed. As in most of the UK today, there is very little direct on-the-road competition between the three bus companies in Tyne and Wear. Instead, each company has settled into a "territory" in which the lack of competition is the key to profitability. Passenger journeys starting in one operator's territory that finish in another's require the passenger to change buses and pay twice. Nexus is no longer happy about this and wants to take over the commercial networks and purchase operations from the bus companies – this is known as a 'Quality Contract' and there is new (as yet unused) legislation to do this. In short a Quality Contract would involve the suspension of deregulation within a specified area and the imposition of a tendered system whereby the transport authority would specify the network, fares, frequencies etc. As urban bus operation outside London is a profitable activity (nationally approximately 90% of bus mileage requires no direct revenue support) the proponents of Quality Contracts believe that massive subsidies would not be required. achieve all the above in an economic, efficient and effective manner. All the above leave lots of room for argument against them, and since the commercial operators would in effect have their businesses sequestrated without compensation it is likely they will use the legal process in full, including the European Court of Human Rights. The alternative approach for a local transport authority to increase its influence in the provision of bus services is the 'Statutory Quality Partnership' as demonstrated in Oxford last year using powers from the 2008 Transport Act. The 2008 Act expands the terms of the previous voluntary Quality Partnership model to allow a LTA [Local Transport Authority — the tier of local government responsible for transport] to specify requirements as to frequencies, timings or maximum fares as part of the standard of service to be provided under a scheme, in addition to quality standards. But it also provides important safeguards to ensure that unrealistic conditions are not imposed on operators, and that their legitimate right to a fair commercial rate of return on their investment is not undermined. The process by which an operator can object to particular standards included in a scheme relating to frequencies, timings or maximum fares, is an important feature of this. But at the same time it places a responsibility on them to justify the grounds for their objection, thus minimising the scope for vexatious or frivolous objections. In the context of Oxford, where such a scheme was implemented last year, there is no history of municipal bus operation. This could account for the partnership approach being more acceptable to that LTA. A transit agency that had been charging for transfers (changing from one transit vehicle to another) eliminated that charge. No other major changes happened at the same time. A result could be measured in fare revenue, and also ridership. If anyone's familiar with cases, or with studies of this issue, please let me know. Thanks! The work, led by consultant Joshua K. Anderson, is admirably wonky. It analyzes a huge range of arterial segments to identify those that appear best from a standpoint of both constructibility, demand, and nexus with livability values. The report is a "screening" study, which means it seeks to narrow the range of possibility and encourage more detailed study of those that remain. BRT is 4 defined by four main components: 1) dedicated bus lanes, 2) at-grade boarding, 3) pay-before-you-board stations, and 4) signal-prioritized intersections. This definition is met by almost none of the things now called BRT in North America, or at least not continuously from one end to the other. But screening is a time to be ambitious about such things. The 10 corridors that survive the screening are shown on this map. They're a mixed bag: portions of segments, some of them maybe too short to be effective as BRT, but also two very long corridors, Western and Ashland Avenues, one of which is probably the most urgent BRT project in the city. The study appears to be silent on whether these are envisioned as open BRT or closed BRT. Open BRT means that the infrastructure can be used by bus lines that flow onward beyond it to other destinations. To take an obvious example, an Irving Park BRT that ends at Ashland, short of the Red Line's connection opportunities and the high density of the lakeshore, is unlikely to be satisfying as a complete corridor. But if it's an open BRT, usable by buses that continue east, it could well be useful. Unfortunately, a presumption of closed BRT, in which buses can't continue beyond the limits of the infrastructure, seems to be implied by the author's decision to discard super-dense Lake Shore Drive from the analysis simply because of the complexity of branching patterns that it requires; this assumption will have to be reconsidered in light of open-BRT best practice. The study illustrates a common challenge in analyzing large, long transit corridors. Many of the key issues, including available right of way and "livability" impacts, are segment-by-segment affairs; if these dominated the analysis, the result would be a huge pile of largely disconnected short segments, which could not deliver the intended outcomes. So the author streamlined, discarding small segments and emphasizing larger continuous ones, which is quite right. But issues of network integrity and completeness seem not to be fully considered. The report needed to step much further back and describe the underlying geographic structure of Chicago, which determines the type of services that could be relevant to citywide mobility needs. For more on the high-frequency grid principle, see here. Obviously this structure only works, in its purpose to serve any origin-destination pair, if its constituent lines flow all the way across the grid to its natural edge. This is the problem with many of the proposed BRT corridors in the report. Given Chicago's grid structure, and how well it already works, BRT needed to be understood as a system of grid accelerators, just like the Metro Rapid and proposed Wilshire subway in the similar grid of Los Angeles. Obviously, if you can concentrate particularly heavy demand on a few elements of the grid, you can justify an overlay of much faster service, stopping only at the grid connection points every half-mile. On that score, Western Avenue is clearly a winner. It is the longest arterial in Chicago, running north-south the entire length of the city. Its extreme length creates reliability issues on a local-stop service, which has caused CTA to break it into three lines thus reducing its usefulness for continuous movement. BRT would be an opportunity to recombine these three segments to offer a service that would be understood as an intrinsic feature of Western Avenue over its entire length. Western is also far enough out of downtown that the direct paths it serves are much faster than riding rail into downtown and back. A vast range of trips between many parts of Chicago would find a Western BRT line useful. None of the other corridors identified in the study can match Western in the utility that arises from extreme length with lots of connection opportunities. Ashland is obviously close. Most of the other proposed segments are simply too short, and would be useful only as open BRT segments used by buses that run further. Effective BRT has to serve long corridors, because the tradeoff that BRT requires of the customer — walk further in return for faster service — makes sense only for a fairly long trip. Open or closed BRT? They're totally different, and if you're not clear which you mean, it's impossible to envision the service patterns, and thus the mobility, that your proposal will offer. Integration with the total network, not just rail. This requires seeing how the whole mobility flow of the city works, and how each corridor would contribute to that flow. Localized analysis that asks where BRT would be easy to create or locally beneficial can easily lose this "forest" in its obsession with the trees. Understanding this principle would have required a much firmer focus on complete corridors that traverse the grid and make many connections, rather than the small fragments that are frequently proposed. Still, the report can do a lot of good, and bravo to the Metropolitan Planning Council for sponsoring it. Chicago really needs to start accelerating its bus grid, especially on its busy, high-stakes, versatile corridors like Western. I hope this study helps to move that along. The New York Times today bewails the loss of Los Angeles bus line 305, which soon will stop running diagonally across the city's grid, from Watts to Beverly Hills and Westwood. The 305 was one of several lines created under the consent decree, and it is the only direct route from the city’s impoverished southern neighborhoods to its affluent West Side, where legions of janitors, nannies and maids work each day. Line 305 is a diagonal shortcut across a high-frequency grid, where trips between anywhere and anywhere can usually be made on lines running every 15 minutes or better with some are far more frequent than that. Meanwhile, the Line 305 frequency is every 40-60 minutes. [PDF] That means that the 305 is the fastest path between two points on the line only if it happens to be coming soon. If you just miss one, there's another way to get there faster, via the much more frequent lines that flow north-south and east-west across this entire area. The 305's low frequency exposes its riders to the risks of waiting for a single bus: you're basically making an appointment with one driver who may not show up for a variety of reasons. Routing the same trips via the high-frequency grid means much higher reliability, because the abundance of buses along a line means you are less dependent on any one of them. Most important, the alleged target demographic — trips from the "poor south" to the "affluent west" for domestic workers — was mostly not served by the 305. Both the "poor south" and the "affluent west" are enormous areas. So no one bus line was ever going to connect all or even most of the "poor south" with all or even most of the "affluent west." These points, but especially the last, identify a public transit service as symbolic. Symbolically, the 305 links the "poor south" and the "affluent west," and thus helps everyone feel good about having served domestic workers. In fact, the 305 runs through a small part of the vast "poor south" and a small part of the vast "affluent west," but it's still useless for most of the people making that kind of trip, because both areas are so large that no one bus line, or even five, could link all of the likely origin-destination pairs between them. This problem is why frequency and connections were invented. The governing principle of transit in these core parts of Los Angeles is the high-frequency grid, which allows everywhere-to-everywhere travel at high frequencies with at most one connection. Yes, it may be sad that some domestic workers who are used to zero-transfer trips are now going to have a one-transfer trip, but that only means that 305 riders will have the same level of transit mobility that everyone else has, including most domestic workers. It also means that Los Angeles transit will be treating all of this demographic equally, rather than arbitrarily preferring people whose path happens to lie along Line 305. The other moral of this story is even simpler: If your mission is to serve a whole city or region, designing transit routes around any self-identified group of people is almost always a bad idea. Most successful and attractive transit seeks maximum versatility, by serving the most diverse possible range of demographics, trip purposes, and origin-destination pairs. You can make exceptions where a single demographic group produces sufficiently massive ridership, as in some commute markets. But in general, the way people self-organize and self-identify politically is a bad guide to how to meet their transit needs efficiently. Everyone can draw the perfect transit line just for their interest group, but such proposals tell you nothing about what a good transit system would look like. Nobody should be happy about the severe cuts being imposed on many US transit agencies that urgently need to move in the opposite direction. But as in San Francisco in 2009, cuts are sometimes an opportunity to delete services that have passionate, well-connected defenders, but that simply don't make sense if your goal is a complete network that people can use to go wherever they're going.